A porridge with a difference – a quinoa and apple porridge with cinnamon which is tasty and oh so healthy. The expression “super-food” might have been over-used but quinoa is worthy of that title. It contains plenty of high-quality protein, is low in calories and rich in essential fats, calcium, iron, minerals and vitamins such as B-vitamins and vitamin E.
Essential fats Omega 3 and Omega 6 are the brain’s best friend – they are essential for proper brain function. So it’s a good idea to start your day with food that includes a lot of seeds (quinoa is technically a seed) and nuts. Take a look at my other Breakfast Recipes for more ideas of how to incorporate nuts and seeds into your breakfast. While oats contain gluten, quinoa does not so it is a good alternative for those with gluten intolerance. Having said that, it is a specific part of gluten called gliadin which is apparently what causes an allergic reaction, and gliadin is not found in oats. You might be able to eat oats even if you have gluten intolerance but buy organic oats in such case. Oats can be contaminated with gliadin if it has been processed at mills that also handle wheat. I know, it sounds picky but if you have gluten intolerance it’s better to be safe than sorry. I am adding ground omega 3-rich flax/linseeds to this quinoa and apple porridge. You can buy already ground flax/linseeds, or you can grind whole seeds in a food processor or blender. Serve the porridge with some nuts – such as walnuts, almonds, pecan, pistachio and Brazil nuts – some extra chopped apple and either plain almond milk, milk or natural yogurt. If you are able to eat oats, you could eat the porridge with oats milk. 1. Start by rinsing the quinoa under plenty of cold water. Drain in a sieve and add to a pot together with all the other ingredients and bring to a boil. Lower the heat and leave to simmer for 15 minutes – stirring every now and then. 2. 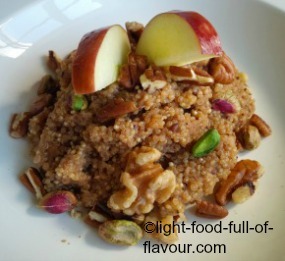 Divide the quinoa and apple porridge between two plates and top with chopped apple and nuts. Serve with plain almond milk, milk, oats milk or yogurt.